Professor Sir Robert Edwards – known affectionately as the ‘father of IVF’ for his pioneering work with Patrick Steptoe – will always be remembered as one of our greatest scientists. His ground-breaking research is still informing the latest developments in a number of areas of medicine. But Bob also has a living legacy, over 13,000 ‘Bourn Hall Babies’ and 5 million IVF babies worldwide, and the gratitude of their parents for whom he made possible their dreams of having a family. 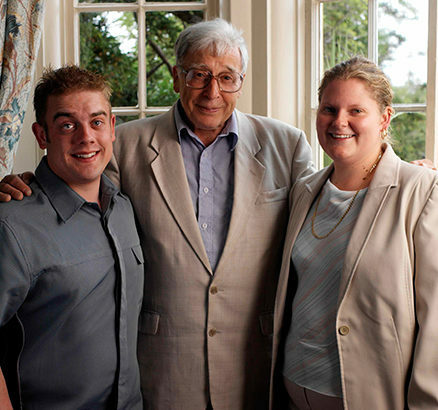 The world’s first male IVF baby is Alastair MacDonald, born just a few weeks after Louise Brown, and a lifelong friend. He gives his own tribute to his ‘Uncle Bob’ below. The family would prefer not to receive flowers but mention that there is an Edwards-Steptoe Research Fund for those who wish to make a contribution in this way. It was originally established in 1973 with donations from patients who wished to support research into the development of IVF techniques. The world has lost a truly great and wonderful man today. In my opinion, the greatest scientist this world has ever seen. No other person in history can claim to have led the way to creating the lives of over 5 million people. 5 million people that simply would not be alive today, had it not been for this genius of a man. Bob would not ever admit to being a genius, nor would he want or desire to have praise for his work in return. He was a man, who, with the greatest self-determination to succeed, made the impossible possible, while making use of what little resources were available while proving his many doubters wrong. What did Bob wish for? Simply to make the world a better place, and he has certainly done that, bringing so much joy to childless couples all around the world. It is with the greatest respect I can say I was truly honoured and blessed to know him. Bob was the most selfless, honourable, kind and decent person you could ever wish to meet. Despite his hectic work calendar, taking him all over the world well into his 80s, he always remained a proud and loyal father and grandfather. His dedication to his work and family was like no other. 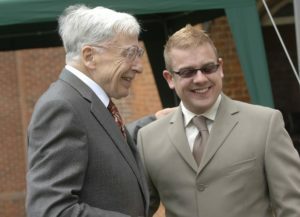 I am extremely privileged to have grown up knowing Sir Robert Edwards as a close family friend. Not just a man who made my life possible, he was always there for me throughout my life and has remained a true inspiration and mentor to me. Bob was and always will remain my hero. A word I know that is so commonly used nowadays, but no one other person can claim to have done so much, for so many, as him. RIP Uncle Bob. You will be terribly missed but your legacy to the world will live on. Thank you for what you have given me. I owe you so much. You will never be forgotten. Find out about Professor Edwards’ work and legacy here.